Reparto: Meryl Streep (Violet Weston), Julia Roberts (Barbara Weston), Ewan McGregor (Bill Fordham), Benedict Cumberbatch (Charles Aiken), Juliette Lewis (Karen Weston), Abigail Breslin (Jean Fordham), Dermot Mulroney (Steve), Chris Cooper (Charles Aiken), Sam Shepard (Beverly Weston ), Julianne Nicholson (Ivy Weston ), Margo Martindale (Mattie Fae Aiken). Guión: Tracy Letts, basado en su propia obra de teatro, ganadora del Premio Pulitzer en 2008. 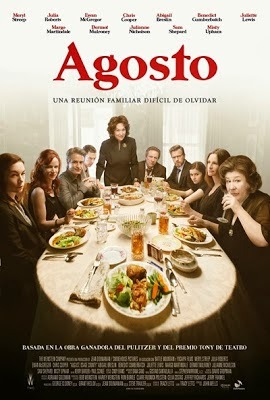 Producción: George Clooney, Jean Doumanian, Grant Heslov, Steve Traxler y Harvey Weinstein. Productoras: Jean Doumanian Productions y The Weinstein Company.